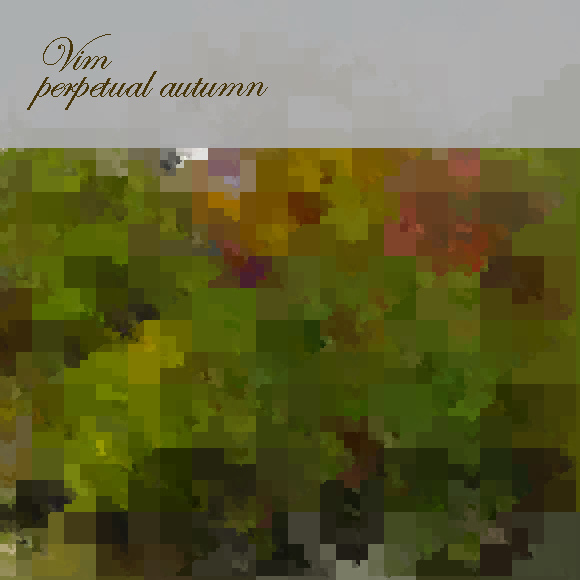 We’ve been releasing maze-like, beautifully complex music from quiet, enigmatic UK idm artist Vim! since 1996 – thus, we’re heading towards his 10-year anniversary on Monotonik, insanely enough. With that in mind, it’s only natural that there might be some maturation of style, coming, as it does, after his real-life album and remix releases on Surgery, Merck, Carpark, and others – the hazy, redolent chiptune sinewave sounds of ‘Perpetual Autumn EP’ show how we all grow up and chill out somehow, someway, somewhen. Therefore, it’s all ‘Chimier’ to start with, ever-obtuse, just not melodically logical, but a wonderfully sideways glance at the chip-idm fringes. Next, ‘C0 pt 2’ is a diode waltz, plain and simple, and an extremely charming interlude, before ‘Wall Of Squares’, with the squares presumably being of the wave variety, blasts into relaxation, eschewing frantic beats for hazy days, before ‘Welcome Afternoon Nap’ takes things down a notch again, delightfully, and ‘Goodbye Payphones’ takes an ambient look at a ‘Rings Around The World’ point of view, sliding off into the sound of somebody trying to reach somebody else, but trying in vain.